Editor’s note: The author conducted interviews with Afghan women refugees in Turkey as research for her Master’s thesis. The United Nations High Commissioner for Refugees (UNHCR) stated in April 2013 that its work in Turkey will focus on Syrian refugees in 2014-2015, and that Afghan asylum seekers are a concern. Thirty years of war in Afghanistan have led millions of Afghan people to leave and seek asylum in safer countries. Currently, about three million Afghan refugees are spread all over the world—mostly in two neighboring countries, Iran and Pakistan. In the last decade, harsh Iranian refugee laws forced many of them to return to Afghanistan, but some departed on the other side of Iran—to Turkey, where they hoped for a better life. Unfortunately, they now face difficult challenges. As a safe location in the Middle East, Turkey has taken in asylum seekers from many of its unstable neighbors such as Iran, Syria, Iraq, or Egypt. Afghans who enter Turkey illegally from Iran are not forced to return, but they must struggle on their own with rough living conditions. Turkey grants refugee status only for European asylum seekers. So for other asylum seekers recognized by the UNHCR, Turkey is more of a transit country to Europe or America. Playing the role of the bridge between East and West, Turkey exercises harsh laws that limit refugees’ and asylum seekers’ basic rights like freedom of movement, the right to work, and education. The UNHCR has been providing refugee assistance. However, in April 2013, the UNHCR suspended Afghan refugees’ files for its own reasons. These reasons don’t satisfy Afghans. The UNHCR stopped helping Afghans who receive no help or very limited help from Turkish authorities, so now the majority of them suffer from impoverishment, especially women and children. For example, Masouma, 28, living in the Turkish city of Nevsehir, recalls how when she and her family arrived in Turkey after passing through the dangerous mountains, they hoped for a better life than what they had in Iran. “It is true that we are secure here, yet we have no rights to work. Even if my husband and I want to work illegally we are not hired because we don’t speak the language. I can’t afford food and other basic needs for my children,” she said. Joblessness is a major problem for refugees from all nations, but the Afghans’ situation is more chronic because they get no financial help from relatives in Afghanistan or abroad like many Iranians and Iraqis. Also many Afghans are illiterate. Language is the main obstacle to them finding illegal work opportunities. The ones who are lucky can work as dishwashers or laborers. Khadija, 30, a mother of four, speaks with tearful eyes as she explains that her husband has to beg outside a mosque to make a living. Continuous war in Afghanistan forced its people to wander around the world and many who seek asylum in developing counties, such as Turkey, live a miserable life. Shafiqa is currently studying abroad. 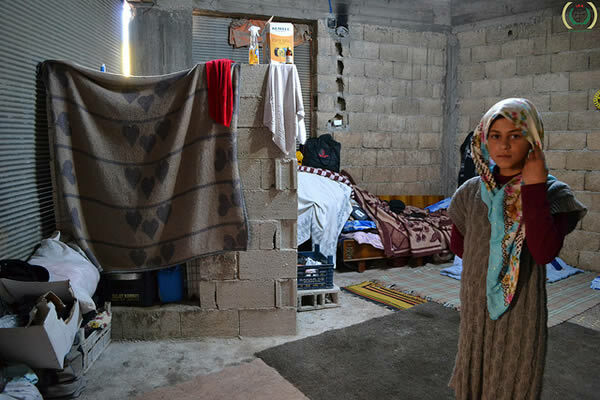 Photo of Syrian refugee home in Kilis, Turkey, by IHH Humanitarian Relief Foundation. This essay had great use of detail, and seemed to be heart felt to how the people really felt. It was moving truthful. Showing what improvements the country needs to make, but the people have a say so in this too. It is up to them to make the change and not to sit back and wait for it to happen… It Starts With One! Well done essay backed up by research. I hope it gets a huge international audience. Keep putting your words out there, we are listening.